Region 1:The "Money and Message" session has been canceled. 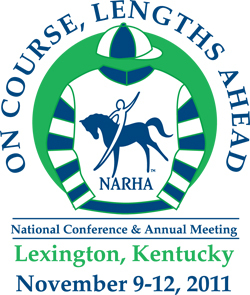 NARHA CEO Kay Green will be offering a presentation in its place: "Strategic Planning: Explore the Components of a Good Strategic Plan That Allows the Organization to Move Forward With Clear Goals and Objectives." The Region 10 conference in Tucson, AZ, has been canceled. Friday, April 22, is the last day to register early for the NARHA Region 9 Conference and receive a $25 discount. The Region 9 Conference is May 20-22 in Haily, ID. After this Friday, online registration is open through May 6. Click here to register. Is your center interested in becoming a NARHA Premier Accredited center? Is your center's accreditation due for renewal? Click here to read the benefits of becoming a NARHA accredited center. Click here for the accreditation application. With the NARHA/EFMHA integration, the EFP/L Membership Task Force took over many initiatives that impact EFP/L members. One such example is the existing EFMHA Yahoo Group. Our task force asked for the expert advice of Brad Lewis, the "owner" of the group and one of the moderators, to help guide us in making important decisions about the Yahoo group. With the integration, the name "EFMHA" no longer exists; thus the "EFMHA" Yahoo group needs to be revisited as to its purpose, function and its name. Brad has been hard at work considering the responses from the Yahoo Group members, and he will be submitting a recommendation to the EFP/L Membership task force soon. We will let you know as soon as the task force has reviewed and voted upon the recommendations. As our task force continues to tackle many exciting initiatives that address the needs and interests of those providing EFP/L, we want to remind you that if you have ideas, needs, concerns or comments for NARHA regarding EFP/L, please contact us directly. We can't make change without you! Contact Leif Hallberg, Chair of the EFP/L Membership Task Force. Many NARHA items are being offered at closeout prices at Equestrian Collections, including Polo shirts, sweatshirts, window decals, and padfolios. Discounts of 30% are offered at the retail and wholesale level. Visit the store to see all the items! Many of us have owned, ridden or worked around a "girthy/cinchy" horse. The behaviors can vary from an unfriendly expression to a dangerous reaction. These horses, on the whole, are often valuable in our programs. However, their behavior on the ground can make them a liability. Horses are 100 percent honest and have very good memories. If they are reacting negatively, then the problem is real to them. It is either due to physical discomfort or the memory of such. Even when we are able to rid the horse of the cause, the memory can keep the behavior alive. Here are some things to consider when trying to rebuild their trust and improve their behavior. Whenever dealing with a behavior issue, first consider that it could be the result of a physical issue. Therefore, have your horse screened for back or wither pain. A veterinarian, equine chiropractor or equine massage therapist should be able to help you out. Secondly, have a knowledgeable person evaluate the fit of your saddle. Ill-fitting saddles are often the culprit of many behavior issues. · Rub your horse's "sweet" spot while you slowly begin to bring the girth/cinch up under the belly. Continue rubbing throughout the very slow and gentle process of attaching or tying to the saddle. Your rubbing touch can help lead his mind to that area versus the place that he is worried about. We want him to associate the grooming/tacking up process with something positive. This way we have a chance of replacing his negative reaction with the anticipation of something good. The horse who used to swing his head around to bite often becomes the horse who looks around with ears pricked, anticipating a reward. Treats are a great motivator! There has to be something good in it for the horse in order for him to want to change his behavior. Although we cannot delete the memory, we stand a good chance of replacing his behavior. As you work through this process be sure to follow the procedures listed in the last NARHA News, "The 'Girthy' or 'Cinchy' Horse and How Not to Create One." * Correct timing of the cue (click) and the reward during this training phase is imperative. If you are unskilled at this type of training, please enlist the help of a knowledgeable trainer to help get you both on the right track. NARHA is now accepting membership applications for the newly established NARHA Horses for Heroes (NH4H) Committee. The development and sustainment of NH4H as a premier program leading equine-assisted activities and therapies (EAAT) on behalf of America's wounded military and veterans is greatly influenced by the quality of its committee membership. NARHA seeks members having a diversity of backgrounds and experiences and a strong dedication to the mission of the EAAT industry. Willingness and ability to volunteer individual time to NH4H matters over the period of committee membership is essential. Expertise in the areas of strategic planning and execution, development, veteran's affairs and/or experience with an existing NH4H Center program is very helpful but not mandatory. The key is to identify the right individuals to help lead NARHA Horses for Heroes to future successes. Historically, NARHA membership has been a great resource for helping to identify future NARHA leaders, either by pulling from our own ranks or from our broad network of professional acquaintances. Committee commitment is for two years, and attendance at monthly conference calls is essential. Motivated applicants may apply by May 3rd. Please send your resume to Nicole Pepper. Riders in NARHA Horses for Heroes programs are invited to participate in the 2011 NSBA World Championship Show Very Special Event "Heroes On Horses" competition. Riders must be disabled veterans or active duty "wounded warriors" who are participating in NARHA Horses For Heroes programs. Heartland Equine Therapeutic Riding Academy (HETRA), a NARHA Premier Accredited Center, has received a grant in the amount of $20,000 from the AIM Institute. The grant is a capacity/technology grant that will allow HETRA to work with a developer to develop a volunteer/student scheduling program that is compatible with Salesforce (HETRA's data management) system. Some of the exciting things this program will eventually do is allow volunteers to log in and sign up for shifts, mark absences and update their information. The staff at HETRA will also be able to automatically populate daily schedules, send out weekly reminders, match up volunteer qualifications with volunteer scheduling needs and automatically calculate volunteer hours. These are all things that will save many hours each week for the volunteer coordinator and allow this person to focus on other volunteer areas. "We are very excited about this grant and not only the impact it will have on our program but the ability to offer it to other programs such as ours that are using Salesforce," said Jodi Teal, Development Director. "We believe this is an area that is lacking in the TR world and will help a lot of programs." There is still room available. If you are interested in attending, please call the center immediately! This certification is almost full. If you wish to attend, please call the center and get your spot paid for! Brave Hearts Therapeutic Riding and Educational Center in Harvard, ILIf you are interested in attending, please call the center immediately as they need more people to sign up in order to hold this event. We have a FREE registered on-site workshop and certification approaching quickly in CO on May 12 in Fort Collins (see the events calendar for details). Please call the center immediately if you wish to attend, as they are in need of more candidates.